Sheikh Mohammed Sultan (1923-1994), more well known as SM Sultan, was a painter from Bangladesh. Sultan was born on 10 August 1923 in Masimdia, Narail district, East Bengal (now Bangladesh). After only five years of schooling in Victoria Collegiate School in Narail, Sultan joined his father to work as a mason. He began to draw the buildings his father used to work on and developed an artistic disposition. He wanted to go to Kolkata to study art, but his family did not have the means to send him there. Eventually, Sultan went to Kolkata in 1938 with monetary support from the local zamindar (landlord). Having inadequate qualifications for admission into the Art School in Kolkata, Sultan only managed to get in through the help of Shahid Suhrawardy, a member of the governing body of the School. Sultan also stayed at Suhrawardy's house and was allowed use of his library. Sultan, however, never completed his education. After three years in the school, his bohemian nature had the better of him and off he went travelling around India and working as a freelance artist. During his travel, he made a living by drawing the portraits of allied soldiers who had camped at the place he was visiting. During this period, his first exhibition was held in Simla, though none of these works have survived, mainly due to Sultan's own indifference towards preserving his work. After living and working in Kashmir for a while, Sultan returned to Narail in the wake of the Partition of India, Narail now part of Bangladesh.Then again, in 1951, he left for Karachi. There he taught as an art teacher at a school, and came in contact with artists like Abdur Rahman Chughtai and Shaker Ali, with whom he developed lasting friendship. In 1950 Sultan had gone to USA - exhibiting his work in New York, Washington, Chicago, and Boston, and later in London. In 1953 he returned to Narail. There he built a school for children, and a menagerie. He lived in a house full of cats and snakes. 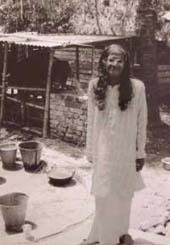 Except for occasional visits to Dhaka (where he had his first exhibition in 1976) he lived in the quiet isolation of his house. A confirmed bachelor, Sultan settled down in an abandoned building in Narail overlooking the river Chitra, where he lived ever since with an adopted family and pets of his own including dogs, mongoose and monkeys. Sultan would later build a mini-zoo near his home. Apart from occasional visits to Dhaka, the capital, Sultan only once left Narail for any substantial period of time. He became interested in a ruined house in Sonargaon, pretty much like his own home in Narail, and lived there for a period. Sultan's first exhibition in Dhaka was in 1976, inordinately late for a painter of his stature. Sultan died in 1994. SM Sultan won the "Ekushey Padak" in 1982, Bangladesh Charu Shilpi Sangsad award in 1986 and the "Independence Award" in 1993. In 1989, Tareque Masud directed a 54 minute documentary film on SM Sultan's life, called Adam Surat (The Inner Strength). Masud started filming it in 1982 with the help of the painter, and traveled with him all around Bangladesh with Sultan. According to Masud, Sultan agreed to cooperate only on the condition that "... rather than being the film's subject, he would act as a catalyst to reveal the film's true protagonist, the Bengali peasant". Bangladesh government recently completed the construction of Sultan memorial complex though it hasn't yet been inaugurated. Sultan, of course, had a special relation with Narail. He was known to the locals as "Lal Mia", a most informal and homely name only to be given to a close person. Chetona Theatre from Norail has staged Aango Lal Mia (Our Lal Mia) on Sultan. In 2005, famous Bangladeshi photographer Nasir Ali Mamun published a book named Guru with 68 photographs of Sultan. These were selected from thousands of photographs taken by Mamun in the period from 1978, when he first met Sultan until his death.